To persist Map of entity keys and basic types values, the annotation @ElementCollection is used on the map field/property. 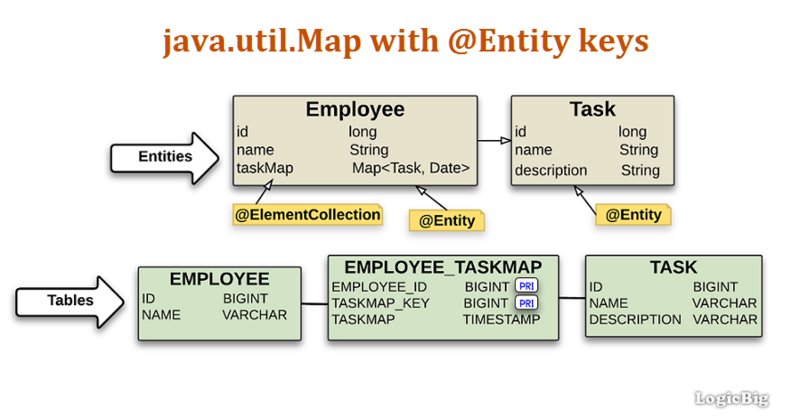 The main @Entity class and the key @Entity class are mapped to three separate tables. The first table for the main entity, the second table for the key entity and the third intermediate table (the join table) for linking the main entity's primary key to the key entity's primary key. The join table also has one column for the map's value. In the join table, both main entity id column and key entity id column are primary keys of the join table. That means, the main entity and the Map's key combination will be unique. That makes sense because a Java Map cannot have duplicate keys. The key entity class should implement the hashCode and equals methods (a general requirement for map keys). By default, JPA naming conventions are used for the mapping. We can customize that by using @CollectionTable, @Column or @MapKeyJoinColumn annotations. This is a simple example with default table/columns mapping. At the end, we will see another example to override default mapping names. h2 1.4.195: H2 Database Engine. For the map key column (the id ref of key entity).